When it comes to welcoming fall, I’ve never been one to jump the gun. I refuse to follow the “no white shoes or britches after Labor Day” rule. Or to put out autumn decorations on September 22 just because the calendar says summer’s over. Until we’re solidly into October, I won’t plant pansies or purchase a pumpkin. Maybe because both those tasks are hard for me. I can never decide whether to fill my pots with purple pansies only or if I want a mix of colors. Do I want pansies with faces or without? Or should I forego pansies and plant johnny-jump-ups instead? But pansy choices are easy compared to deciding on pumpkins. I seem to remember a time when all pumpkins were bright orange. The only choice I had to make was whether to go with a “Bert” pumpkin (tall and narrow like the face of the Sesame Street character) or an “Ernie” (short and round). Now pumpkins come in colors ranging from almost-red to green to black to white, as well as several shades of orange. Some are small enough to fit in the palm of your hand and other so huge it takes strong men to lift them. Some pumpkins even have warts, perfect for creating a jack-o-lantern with acne, should you want to do such a thing. Last year, I tried to create an artful autumn display of pumpkins and squash on the corner of my hearth. It didn’t go well, mainly because I’m not even remotely artful. I bought three flat pumpkins in graduated sizes with the idea of stacking them up, but they kept tumbling over. I also bought some interesting looking gourds and a variety of squashes to arrange around the pumpkins, but it all looked so ridiculous that I ended up cooking the squash and putting the gourds aside to make into birdhouses, a project I still haven’t started. For starters, I wasn’t going to buy my pumpkins from a grocery store chain. Nope. I was going to keep it local by buying from the people who actually grew the pumpkins. I decided upon Little Creek Produce on Gainesboro Grade, primarily because I had recently ridden my bicycle past their place and noticed that they had an awesome number and variety. The first thing I spotted when I got out of the car was a bin filled with miniature squash in a million different colors, shapes and patterns. I chose enough to fill the wicker basket in the middle of my breakfast table and then wandered over to the pumpkin shed. All I wanted was one perfect pumpkin, small enough that I could lift it but big enough that I almost couldn’t. It needed to be round, not cylindrical, and U.T.-orange. And I wanted it to have a sturdy stem that was easy to grab hold of. As it turns out, there were dozens of wonderful choices. So I picked one out and headed to the car with it, only to be stopped in my tracks by something another customer held in her hands. Something green and twisty that looked so much like a snake it was almost scary. “What’s that?” I asked. 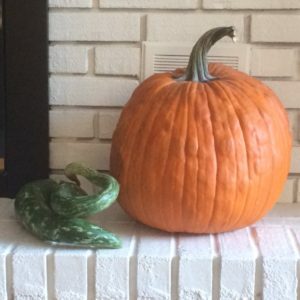 Turns out it was a snake gourd—perfect name!–and that she hadn’t nabbed the last one. 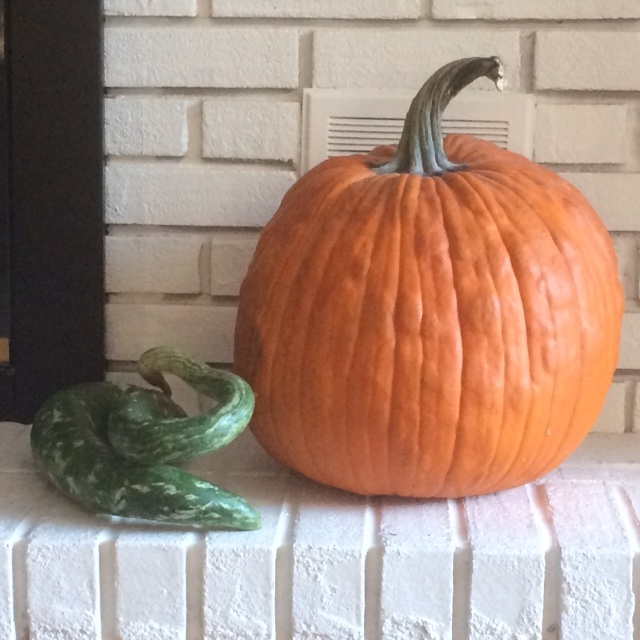 Now I have a snake gourd, too, coiled up on my hearth as though poised to take a bite out of my perfect pumpkin. It may not be an artful autumn display, but at least it stimulates conversation.